Books are a great support in the classroom to bigger themes. What bigger theme could there be than beginning a new school year? These back to school books can help the kids in your class process the transition and learn in the process. Here are my favorite back to school books for kids, grouped by age. Books for this age group will often focus on the separation anxiety that many children experience at the beginning of the year. These books (like Llama Llama Misses Mama and The Kissing Hand) help children feel reassured that their mommy or daddy will come back at the end of the day! Other books focus on the fun things that happen at school, the self-esteem needed for social-emotional development (I Like Myself! ), or even learning the rules of a classroom for the first time (David Goes to School). Kindergarten is so exciting for lots of kids, and also a big unknown. Books for new kindergartners help to tackle this blend of excitement and nervousness. As children grow, not only are they able to understand more advanced books, but they have more complex emotions. It is normal for kids of this age to have more pronounced worries at the beginning of the school year, which books like First Day Jitters, School’s First Day of School, and Wemberly Worried cover in a relatable way. Other books like This School Year will be the BEST! can help introduce class conversations. 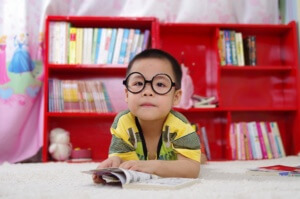 While children of this age can often read independently, read-alouds are still a great idea to build literacy skills. It also helps to have a shared experience like a read-aloud, especially in the beginning of the year. Children of this age are ready for more advanced humor and content that extends beyond their own lives (like It’s Back to School We Go! ).